Today I thought it would be fun to do a tag. I haven't done a tag in awhile. In my typical fashion I couldn't find a "Blogger Tag" with questions I was happy with so I combined a couple and added a few questions of my own. I mixed and matched and added until I found the collection of questions I was happy with. Please feel free to do this tag on your blog or answer the questions in the comments below! I'd love to see your answers! All the questions are at the end of the posts. I hope you enjoy the tag! Let's get to the questions! I made my blog in March of 2015 and uploaded my first post on April 12 2015. I can't believe that I have been doing this for almost 2 years! I have always enjoyed writing and I really liked reading other blogs and watching YouTubers. I really wanted to share my opinions and thoughts on things I loved. I wanted to make my own little place on the internet. My blog has gone through a few name changes since April of 2015. It was just my name for a long time but last summer I decided to change it. The ZombieGoddess part comes from my gamer tag and online name ZombieGoddessxi. I dropped the "xi" and added beauty as it is my main focus and here we are. I really love the name. I think it is memorable and I love that it goes with my online name and gamer tag. As for where the gamer tag came from it took forever to make my gamer tag. I made a list of things I love, most of which were geeky and zombie was on the list. I really love zombie stories but I couldn't really think of what to add to it. Every name Xbox suggested for females had goddess in to so I combined it with zombie and added xi because I thought it made it more original. A little of everything honestly. I started with just beauty but I always wanted it to be about all the things I love. Now I write about Beauty, Lifestyle, Blogging, Nerdy + Geeky things and Reviews. I haven't been doing nerdy and geeky posts as much as I like. I want to do more this year. I also want to do recipes and more DIYs and maybe some travel stuff too. 5. What is the first blog you started following? I started reading Zoella's blog at first but when she took a break from blogging I started reading MissCosmeticBlogger, My Newest Addiction, Maskcara and Robowecop. Now I follow so many wonderful blogs! If your interested you can see a full list of all the blogs I follow on my BlogLovin' page. 6. What is your favorite thing about blogging? I truly love the writing. I really love editing the blog too. I love when I learn to code something new and it works right! 7. 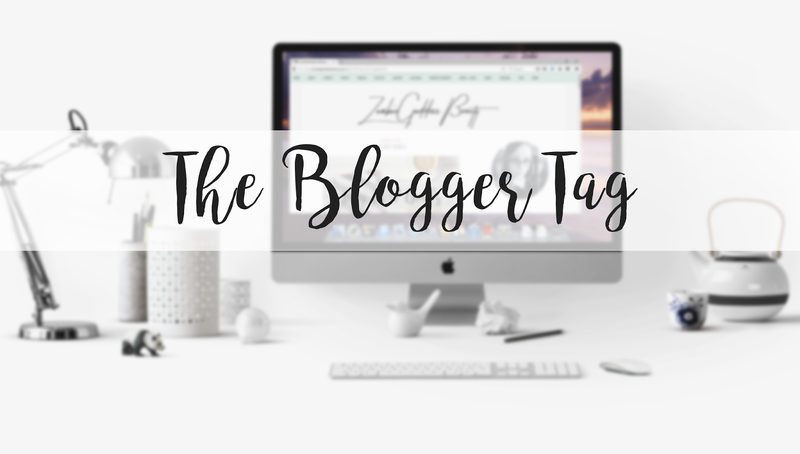 What do you find is the toughest thing about blogging? Most of the time it's photos. Not the editing or taking them really. It's when I know I can't take a photo and I can't find the photo I want on a stock site. And sometimes I just can't think of an idea for a cover photo. 8. What is your biggest blogging pet peeve? I really had to think about this one. I think for me it's when blogger messes up and doesn't save right or when blogger causes my content to appear wrong. 9. What camera and photo editing software do you use? I use a Canon T5 with one of 3 different lens. A Canon 18-55mm lens, A Canon 55-250mm lens or a Canon 50mm lens. And I use Adobe Photoshop Elements 14 for editing all my photos. I made all my own graphics too. 10. What is you dream campaign? Honestly anything with lipstick. I love lip products. I'd also love to do a campaign with any UK brands as I can't get them easily here in the US. I'd also love to do something with travel but who wouldn't. 11. How do you come up with posts ideas? Most of the time I have blog posts ideas coming out of my ears but when I am having a case of writers block I look through Pinterest and my favorite blogs for inspiration. I'll also google blog post ideas as a lot of bloggers have done posts on blog post ideas and reading them can spark ideas for me or if I really like something on the list I can do it. 12. How do you stay motivated to keep writing? I included this question because I lost all motivation in 2016. I have managed to find it again. I think one of the big things that helps me stay motivated is being organized. I have a planner this year and I marked every day I wanted to upload this year. I write posts in as I decide to do them and this way it is easier to hold myself to my schedule. Another thing that helps is staying true to what I want to write. I write about what I'm interested in not what I think will get the most views. If I write about something I love I will be more excited to write than if I write a post for the views. And if there is something I don't want to write, like my product info introductions to reviews, I make myself write them in batches. 13. What are your blogging goals for the next year? I just uploaded my 2017 goals last week. 3 out of the five goals were blogging goals the biggest being to upload more this year. I want to upload 75-100+ posts and I'll like to keep to my new schedule of uploading every other day. 14. What advice would you give to new bloggers? Don't worry about the numbers! Write about what you love not what you think will get views. Seriously don't worry about the numbers. You aren't going to get a huge following overnight. You may write your blog for years and only get 100 followers. And page views aren't going to be very high at first and that's ok.
Get inspiration but don't copy. Drawing inspiration from other bloggers is great but don't copy exactly what they are doing. We all get inspiration from blogs and channels we love! Just don't copy them. That being said looking at blogs you love can be a great way to end a case of writers block. Use stock photos not google image. Sometimes you just can't get the right photo or maybe you don't have the means to get the photo your want. We have all been there, but make sure you use legal stock photos instead of google images to avoid a copyright claim. And if you really like a photo on a blog ask to use it first and always give credit! Get a planner or download a blog planner to stay organized. My planner has been a god send this year! I only uploaded 34 posts last year. This year I've already uploaded 11 and this is my 12th! Organization is the key to motivation. Huh, I should put that on a tee shirt. Use Twitter! Tweet posts, old and new. Tweet posts with some relevant hashtags so more people see it. Tweet about products or recipes your are trying. And interact with your favorite bloggers. Follow blogger communities like The Girl Gang and Female Bloggers RT. Follow your favorite bloggers and brands a tweet with them. Twitter is your biggest blogging tool! And don't forget to respond to your followers even if you just like their tweet so they know you have seen it! Let them know they are heard! Schedule Tweets! Scheduling tweets is the best! You can schedule tweets for your old content for weeks in advance and sit back and forget about having to tweet them. Unlike a lot of tweet scheduling services this one is free and has not tweet limit! I just started using FutureTweets to schedule tweets. And I really like it. FutureTweets doesn't shorten links like twitter automatically so I suggest using bitly to get 22 character links so you save character space. Finally, BlogLovin' Get on BlogLovin'! It's a great way for your followers to follow your blog for updates and it's a great way for new readers to find you! You can also follow your favorite blogs and find new blogs to read! Wow that was a lot. I might need to make this into a post of it's own. 15. Lastly, Recommend 5 Bloggers for anyone reading this to check out. The blogs I've been really loving at the moment are MissCosmeticBlogger, Maskcara, Robowecop, The Makeup Directory and A Little Obsessed. I want to recommend every blog I love! But we would be here all day. If you like you can check out my Blogs I Love page to see all my favorite blogs. That was so much fun! I hope you enjoyed this tag! If you are a blogger I'd love to see you answers! If you do this tag please leave the link in the comments! Also if your a reader or a blogger I want to hear your answer question 15 in the comments! I love finding new blogs to read! I tag Beth from MissCosmeticBlogger, and Jessica from Ms. Adventures in Makeup. Photo Credit: Cover photo from pexels.com and edited by me in Photoshop.